YSAK 459: Cat for rent, you communist. Once in a lifetime an offer comes along, an offer that is so astounding, so groundbreaking, so cute, that only a fool or a communist would pass it up. You're not a communist, are you? This world is full of landlords with their "no pet" rules, immune systems with their "allergies", Dogs with their "hunting instincts" and furniture with "shreddable fabric". 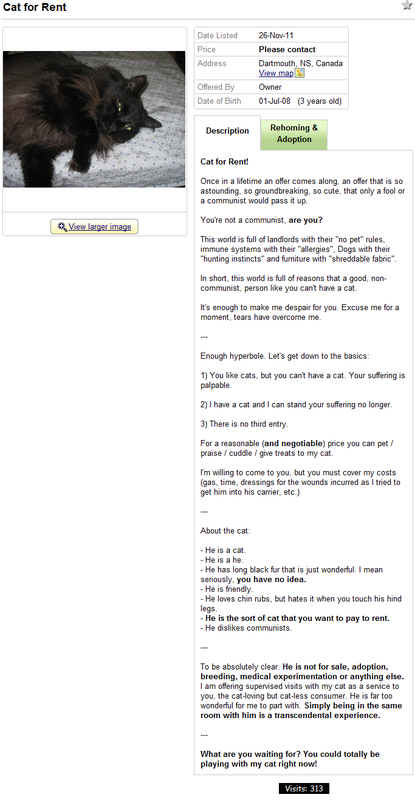 In short, this world is full of reasons that a good, non-communist, person like you can't have a cat. It's enough to make me despair for you. Excuse me for a moment, tears have overcome me. 1) You like cats, but you can't have a cat. Your suffering is palpable. 2) I have a cat and I can stand your suffering no longer. 3) There is no third entry. For a reasonable (and negotiable) price you can pet / praise / cuddle / give treats to my cat. - He is a cat. - He is a he. - He has long black fur that is just wonderful. I mean seriously, you have no idea. - He loves chin rubs, but hates it when you touch his hind legs. - He is the sort of cat that you want to pay to rent. To be absolutely clear. He is not for sale, adoption, breeding, medical experimentation or anything else. I am offering supervised visits with my cat as a service to you, the cat-loving but cat-less consumer. He is far too wonderful for me to part with. Simply being in the same room with him is a transcendental experience. What are you waiting for? You could totally be playing with my cat right now! should have said you could be playing with my cat right MEOW!